Peaches are a plenty this time of year and while peaches are traditionally saved for desserts, it is always fun to think outside the box and use them in nontraditional recipes. In this particular recipe, the peaches give a sweet taste to bulgur salad that yields an incredibly healthy, crisp and refreshing summer time meal or side dish. Bulgur is a hearty quick cooking whole grain that has been parboiled, drained and ground. It is nutritious and has a slightly nutty taste to it and makes meal preparation a cinch since is quick to prepare. 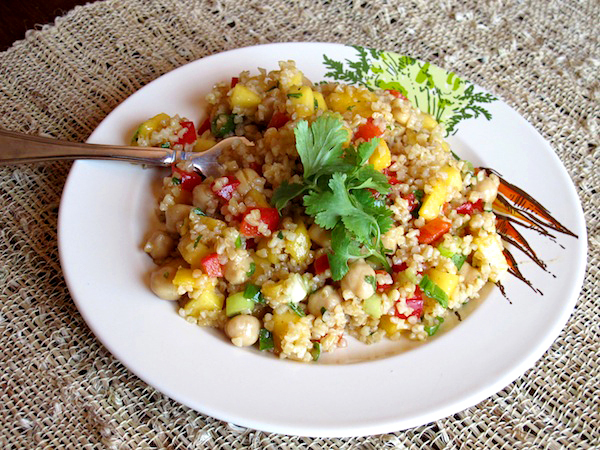 Bulgur wheat is high in fiber and protein. It is also one of the richest sources of folate or vitamin B9 available and contains iron, phosphorous and manganese. In this recipe, peaches give a sweet taste to bulgur salad that yields an incredibly healthy, crisp and refreshing summer time meal or side dish. Adapted from: Nectarine & Chickpea Couscous Salad - Cooking Light, Year 2000. Prepare the bulgur according to package instructions using chicken broth instead of water for added flavor. When the bulgur is complete, fluff with a fork and let cool slightly. While the bulgur is cooking, prepare the dressing in a large bowl. Stir well to combine, then add the peaches, green onions, red bell peppers, beans and cilantro leaves. Add the bulgur and toss well multiple times. Garnish with additional cilantro leaves and/or peach slices.